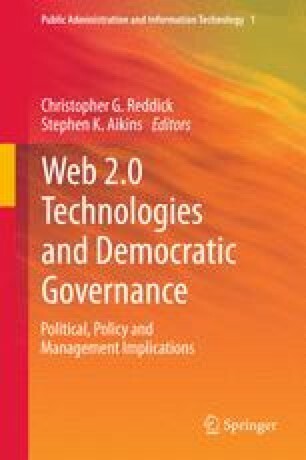 Web 2.0 tools and applications encourage citizens to interact with government and they provide tools for government to communicate, collaborate, and engage with citizens. The distinguishing characteristics of some of these tools provide unusual opportunities for citizen participation in government decision-making and exercising influence on diverse policy domains. However, there is limited research on the role of specific tools and applications in government–citizen interactions. In fact, there are relatively few studies that attempt to understand how governments and citizens are using these tools to interact with one other. Based on three powerful stories from Mexico, this chapter focuses on one of these tools: Twitter. It analyzes both citizen and government use of this application, provides practical recommendations, and suggestions for future research about this topic. Bannister, Frank, and Regina Connolly. 2011. Trust and transformational government: A proposed framework for research. Government Information Quarterly 28 (2):137–147. doi: 10.1016/j.giq.2010.06.010. Bertot, John Carlo, Paul T. Jaeger, and Derek Hansen. 2012. The impact of polices on government social media usage: Issues, challenges, and recommendations. Government Information Quarterly 29 (1):30–40. doi: 10.1016/j.giq.2011.04.004. Cheong, Marc, and Vincent Lee. 2011. A microblogging-based approach to terrorism informatics: Exploration and chronicling civilian sentiment and response to terrorism events via Twitter. Information Systems Frontiers 13 (1):45–59. doi: 10.1007/s10796-010-9273-x. Expansion, CNN. 2010. Twitter, ¿Enemigo del Alcoholimetro? http://www.cnnexpansion.com/tecnologia/2010/01/18/twitter-enemigo-del-alcoholimetro. Accessed 09 febrero 2011 2012. Gallupe, R. Brent. 2007. The Tyranny of Methodologies in Information Systems Research 1. Data Base For Advances In Information Systems 38 (3):20–28. doi: 10.1145/1278253.1278258. Golbeck, Jennifer, Justin M Grimes, and Anthony Rogers. 2010. Twitter Use by the U. S. Congress. Journal of the American Society for Information Science 61:1612–1621. doi: 10.1002/asi. Grimmelikhuijsen, Stephan G. 2010. Transparency of Public Decision-Making: Towards Trust in Local Government? Policy & Internet 2 (1). doi: 10.2202/1944-2866.1024. INEGI. 2011. Population by State. http://cuentame.inegi.org.mx/monografias/informacion/mex/poblacion/default.aspx?tema=me&e=15. Accessed 1 November 2011 2011. Rose, J. 2009. The role of Social networking software in eParticipation. DEMOnet Booklet 28:403–426. doi: 10.1177/0894439309341626. Noticias, SDP. 2010. Estudiante Narra por Twitter irrupcion del Ejercito en el Tec de Monterrey. http://sdpnoticias.com/sdp/contenido/nacional/2010/03/22/19/1013808. Accessed febrero 8, 2012 2010.